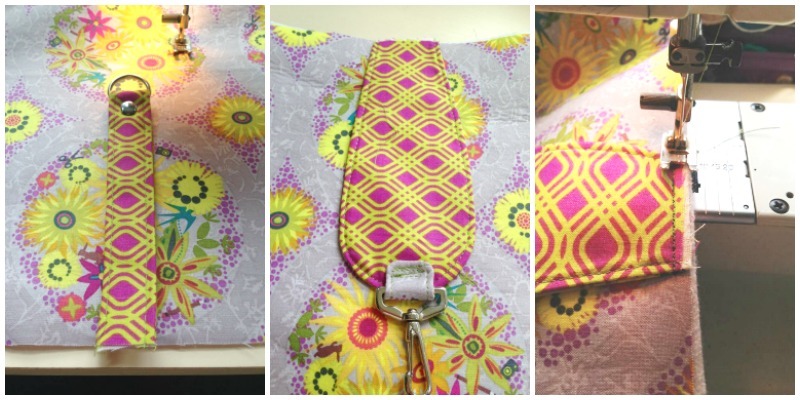 Welcome back to part two of our Reversible Hobo Bag Sew Along with Christine from Bags by Bags of Style! You can find part one here, and don't forget to use your discount code if you haven't got the pattern yet! 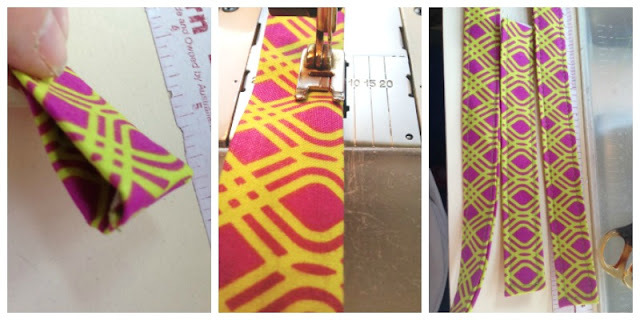 We've already prepared our fabric, applied the interfacings, and we're ready to sew, so over to you Christine! side accents and front catch in fabric........you have already folded them and pressed them, now you're going to open up that centre fold and fold it back on itself, so the right sides are together.........and sew a 1/4 in from the top right across.............clip both corners carefully.......if you do it too close you will end up with fraying . Side accents and lower fastening strap in faux leather, Liz showed us how to do this at camp, I use a little glue to secure, then fold both sides into the centre and clip, using my Teflon foot and a long stitch length, top stitch along both edges, then I do a further row of stitching approx 1/3 inch in from the first row. 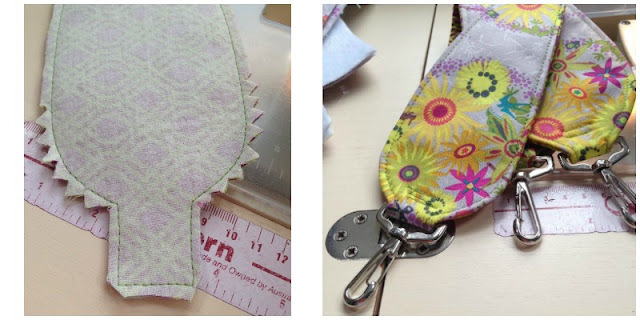 strap............lay both pieces right sides together and clip, sew around leaving a gap of approx. 2 inches at the side......once you have done that, make sure you clip the corners of the top and bottom square ends and notch around the curves.......it will not sit properly if you don't do that....I know, I've tried. Turn it the right way, you may need to use a chopstick to push those corners through, then press well, turn in the seam allowance on the area you left opening so it's folded and flat........then topstitch all the way around. Add your hardware.......fold over the little square end of the handle and secure either by adding a couple of lines of stitching, using rivets, or Chicago screws. 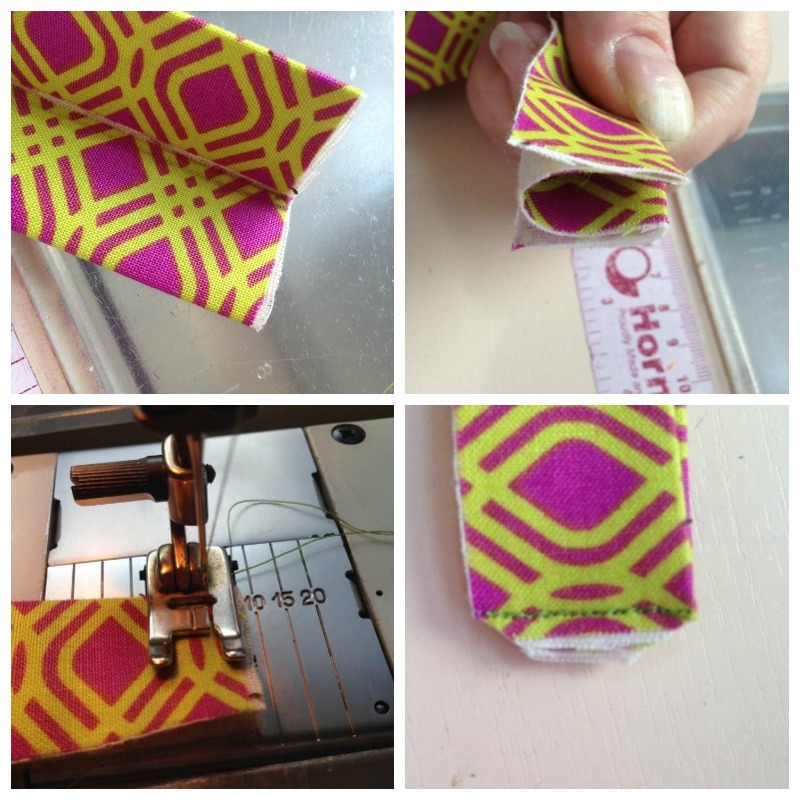 flap.......lay right sides together and stitch using a 1/2 inch seam allowance. 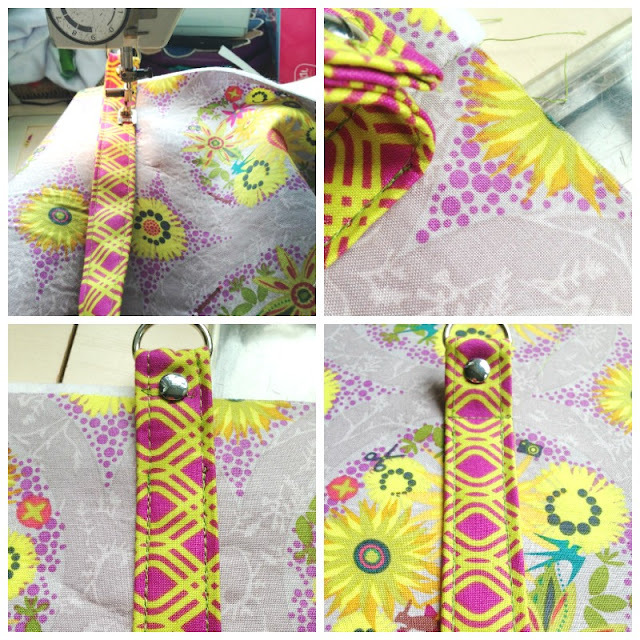 DO NOT SEW ACROSS THE TOP...........in the same way as you did for the strap you need to clip the corners and notch the curves.......turn the right way and roll the curve between your thumb and finger to make sure the seam is on the edge.....press and topstitch.....not along the top. Add your hardware in the same way you did for your strap. 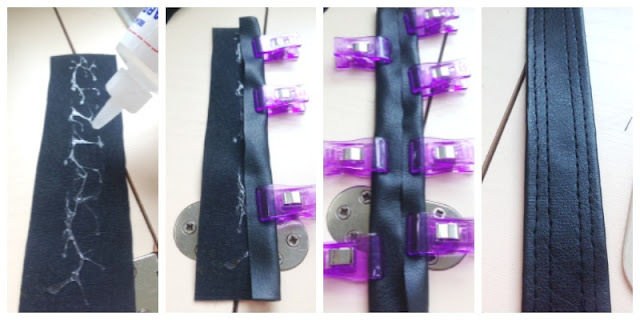 NOTE.......if you are using faux leather for your strap and/or flap you will not need fleece. 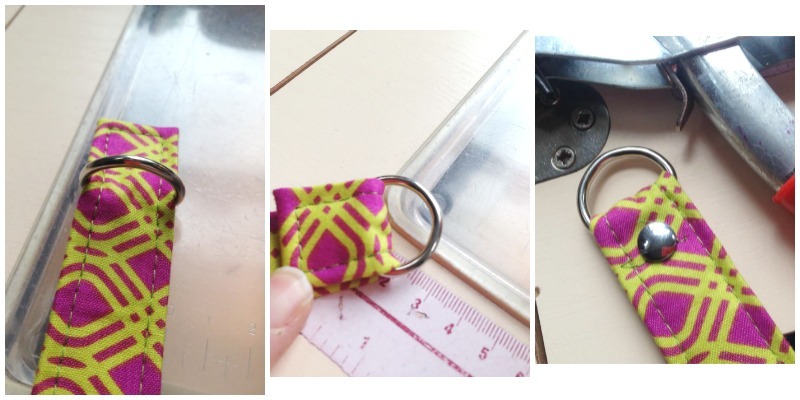 If you are using FL on one side and fabric on the other, add fleece to the fabric only. 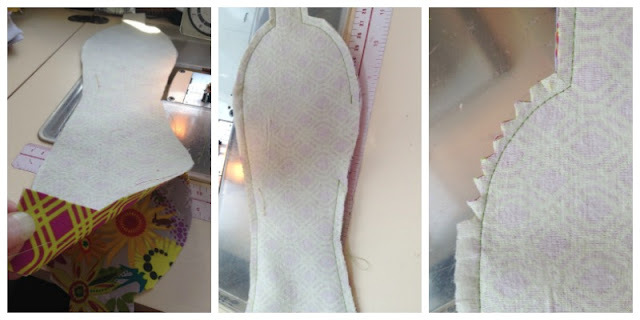 If you are using very thick faux leather you may be better to cut away the seam allowance from the pieces and lay them wrong sides together and topstitch around the outside, you may need to colour the raw edges after you have done this. now we are ready to start putting the bag together, first we add the flap and lower fixing strap, fold the front panel in half and finger press to mark the centre line, put the short strap centrally over your folded line, I add a little glue just to stop it slipping. 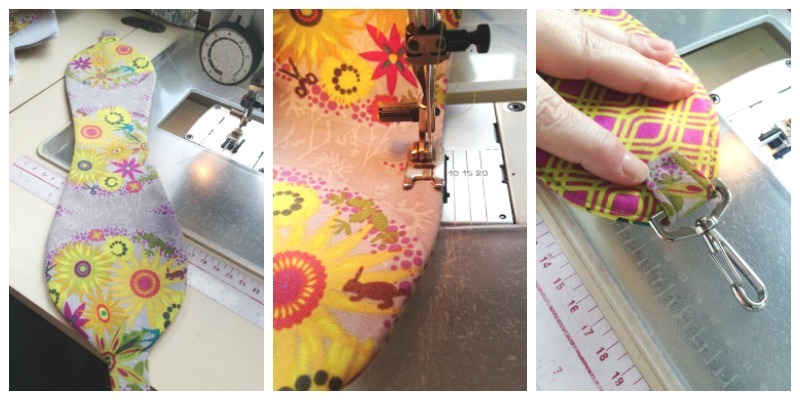 Stitch over your existing stitching to secure it to the front panel. 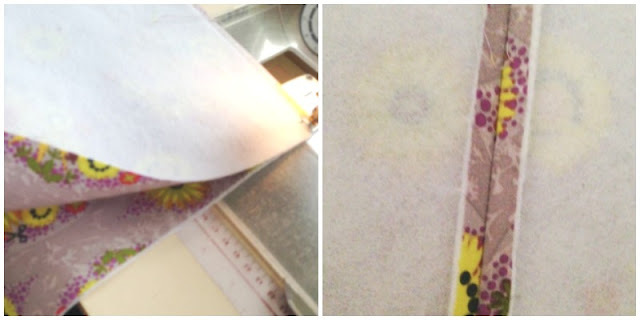 For the flap fold the back panel and finger press to mark the centre, lay the flap right sides together with the outer panel, stitch at 1/4 inch to secure to the top of the bag. put front and back bag panels right sides together and sew one side seam, open the bag and press the seam open. place your side accent strip centrally over the seam ensure that the bottom is level with the edge of the bag, you will have a small amount of strap overlapping the top of the bag, I use glue but DST would work equally as well to hold it in place, secure it by sewing over your existing stitching, do not go right to the top of the bag. I stitch to approx. 1.25 inches from the top of the bag. Sew the side seam the other side of the bag and press open the seam then repeat with the side accent ......I always use my machine as a free arm to do this as I find it easier, but it can be done flatbed too. 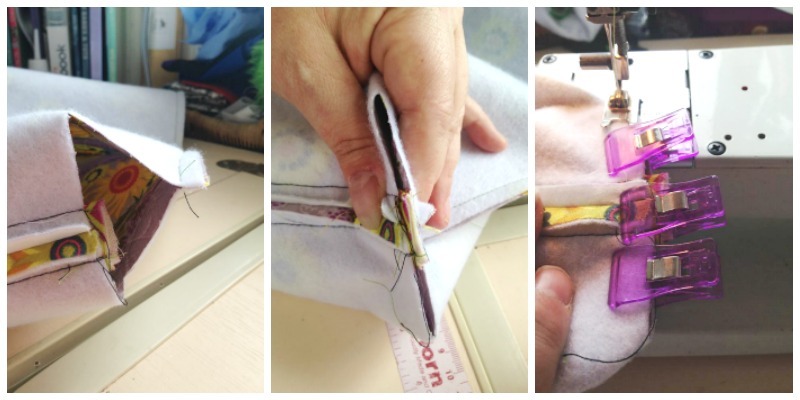 Last bit for today we are going to sew the boxed corners of our bag.........you can see the way the bottom sits in the first photo, you need to pinch the bottom so the bottom seam and the side seam meet, try and make sure that it's straight or your bag will have a wonky bottom.......none of us want one of those do we? Flatten out the seams so it's not too bulky........clip, and sew, I always do two rows of stitching close together for security. Repeat on the other side..........then turn your bag in the right way and push the bottom corners out......you have completed the outer part of your hobo. It's time for a break, we'll be back with more next week!